What Kind of Priest Do You Want? Please send me the "Where Heaven Meets Earth, Restoring the Sacred at St. Peter's Church" DVD. I am excited to see the "Where Heaven Meets Earth" documentary as I have two years left in seminary formation and hope that this will aid me in my formation as a future parish priest and pastor. So we not only sent Chris his DVD, we were inspired to take this a step further and gifted 50 "Where Heaven Meets Earth" DVDs to seminarians who attended the Institute for Priestly Formation this summer. The Institute for Priestly Formation (IPF), a non-profit Public Association of the Faithful, serves bishops by working directly with priests, seminarians, and seminaries so that spiritual formation is the center around which all other aspects of priestly formation are integrated. They have served close to 2,000 priests and seminarians from over 154 dioceses in the United States, 38 international dioceses, and eight religious orders. Every priest is ordained with a passion for Christ, a deep love for the Church, and a zeal for the priesthood. However, attention to the spiritual life can easily be lost in the midst of the many demands on a priest’s time. This results in a weakened priesthood, leaving the laity hungry for spiritual leadership. What kind of priest do you want hearing your confession? What kind of priest do you want anointing your aging parents? What kind of priest do you want forming the souls of your grandchildren? We want the story of Restoring the Sacred at St. Peter Church on "Where Heaven Meets Earth" to aid Chris in his formation and the formation of more future priests... inspiring them to restore the sacred all across America. If you'd like to help defray the cost of this strategic DVD giveaway and other strategic outreach programs like it, designed to reach the influencers who will help bring about the restoration the sacred, you can give today on our donate page. If you can't give but would still like to support us, please pray for our work. And finally, if you are a seminarian who attended IPF this summer and did not receive a DVD but you would like one please contact us at storytel.org/contact. Calls for Encore Heard at EWTN! 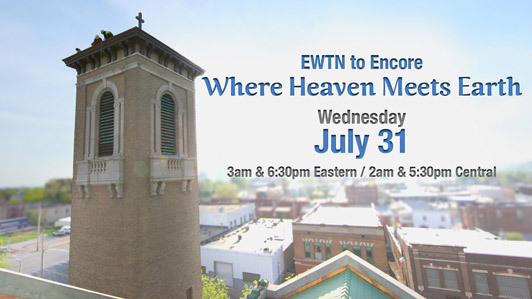 Thanks to your tremendously positive feedback, EWTN will encore "Where Heaven Meets Earth" on Wednesday, July 31 at 3am & 6:30pm Eastern / 2am & 5:30pm Central. “Where Heaven Meets Earth” has earned an abundance of praise and many noteworthy accolades from the general public, priests, sisters, other religious and of course wonderful people like yourself. DVDs, trailers, and millions of viewers! 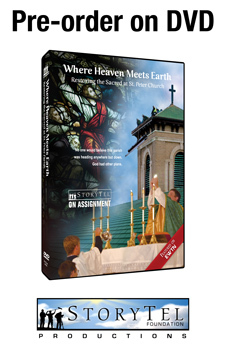 StoryTel and Saint Peter Church have been receiving hundreds of DVD requests for this production from all over the US, Canada, Australia, and even from the United Kingdom; over 20 thousand unique visitors have seen the "Where Heaven Meets Earth" trailer online, and -- of course -- millions of people watched the EWTN premiere on April 30, 2013. We've always encouraged On Assignment viewers to request DVDs from the organization highlighted in the film after the credits roll because we believe these organizations deserve support from viewers. Now, EWTN also wants to offer "Where Heaven Meets Earth" on DVD in the EWTN Religious Catalogue because the program received so much praise, and so many requests for DVDs after airing the program for only one day. Requests for DVDs and anticipation for the program began to build in the days leading up the EWTN broadcast largely due to the success of our first-ever marketing initiative for an On Assignment film. Subscribe to updates to be the first to receive trailers, and other exclusive content. Dan Burke, Executive Director of the National Catholic Register, reached out to StoryTel and wrote a great piece on Restoring the Sacred and "Where Heaven Meets Earth." Thanks Dan!